Mount Ruapehu could be viewed as New Zealand’s Kilimanjaro: the upper slopes of its formidable volcanic mass tower above the plain below, hosting glaciers that, considering the surrounding desert climes, have only the most tenuous claim to existence. 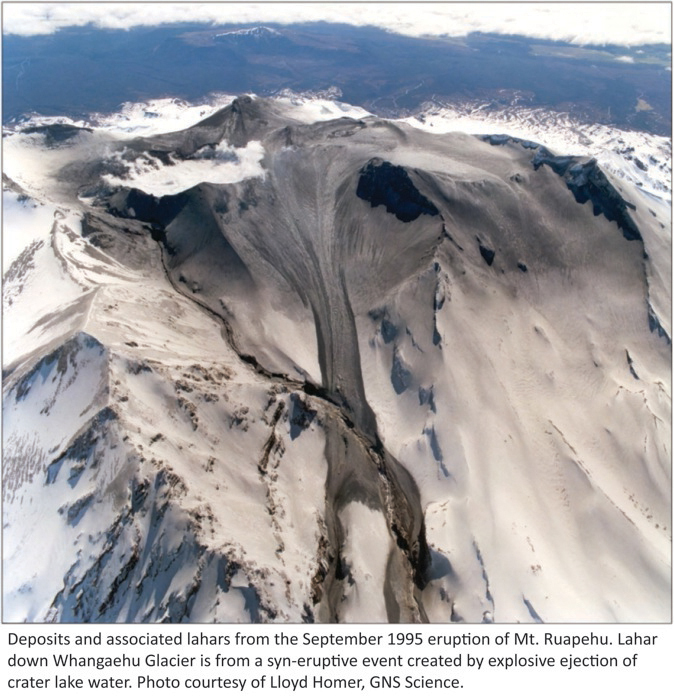 As is the case with its Tanzanian counterpart — vividly documented in the 2006’s An Inconvenient Truth — Ruapehu’s glaciers have diminished considerably during historical times. The 20th Century recession of glaciers around the world has been one of the most ubiquitous and manifest signs of global warming to date. Previously we’ve seen how Antarctic Research Centre scientists have demonstrated this trend in the temperate glaciers of the New Zealand Southern Alps, albeit with anomalous, climate-driven advances of certain glaciers since the early 1980s. The ARC also has a keen scientific interest in the only remaining glaciers of the North Island. Ruapehu owes much of its misshapen form to the erosive influence of glaciers, which, during glacial periods, were dramatically expanded. Today, the mountain’s small residual glaciers are pale shadows of their former glory, and precariously cling to the rough andesitic slopes at the very climatic, latitudinal and topographic limits for permanent ice in New Zealand. Tom Paulin undertook a Master’s project on the Whangaehu Glacier (Ruapehu’s largest) after learning that there had been no major publications on North Island glaciers since 1988, no mass balance studies of this specific glacier had ever been conducted and — as a true sign of the times and trends — the only other similar study to have been conducted on Ruapehu was of a glacier that no longer existed. From 1954 to 1955, the Whakapapa Glacier experienced a 94 m retreat and 10-15 m of vertical downwasting, which led to the exposure of a bedrock ridge, effectively splitting the glacier in two and thus forming the Whakapapaiti and Whakapapanui glaciers. Ironically, it is the Whakapapaiti (‘iti’ meaning ‘small’ in Maori) that has survived: the Whakapapanui (‘big’) has lost so much mass that it is now merely a stagnant ice patch. Glaciers now remain only on the southern and eastern flanks of the mountain where they are relatively shielded from the sun. 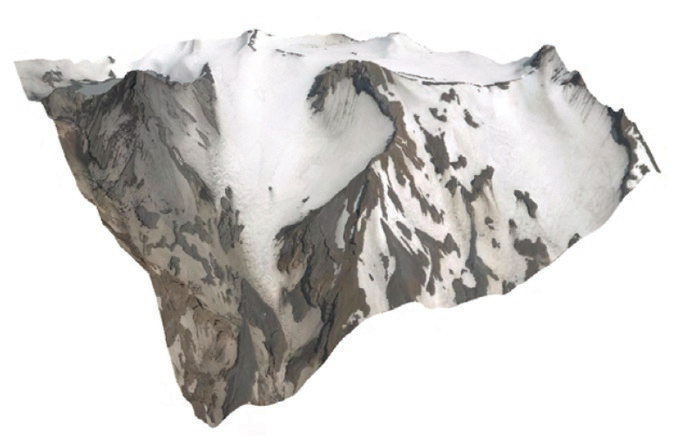 A glacier’s end-of-summer snowline (EOSS) is commonly used in glaciology to quickly indicate the equilibrium line altitude (ELA): the elevation on a glacier surface at which accumulation is equal to mass loss via ablation (sublimation and/or melting). 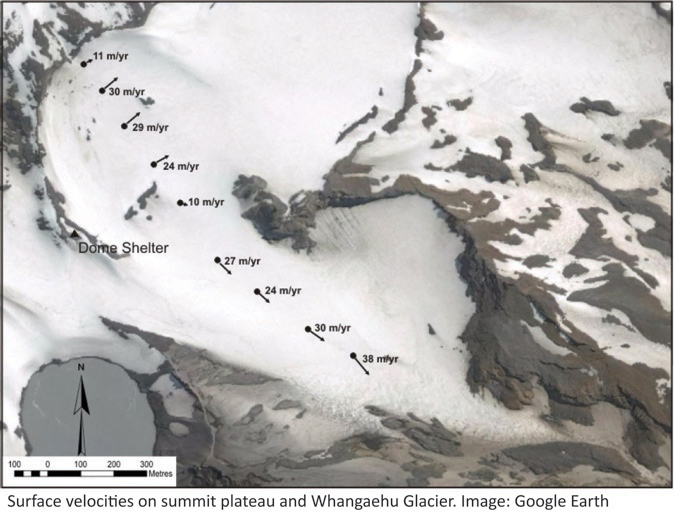 By documenting EOSSs in oblique aerial photos of the Whangaehu Glacier taken in over a 19 year period, Tom was able to get a qualitative sense of the glacier’s mass balance shifts during this time. The inter-annual trends documented by this study were corroborated by snow accumulation data at Whakapapa Skifield, a direct record of the interplay between temperature and precipitation. A quantitative mass balance study was also conducted. Between 2005 and 2007 direct measurements of snow accumulation were achieved by digging pits (up to six metres deep) into the glacier’s residual snow cover, reaching a hard, debris-rich layer that marks the beginning of any given ‘balance year’ of snow accumulation. Measuring the density of snow down the profile allows the calculation of water equivalent precipitation. The largest accumulation directly measured was 2988 mm (water equivalent) as averaged across the glacier surface. A hot water drill was used to install 15 four metre plastic stakes into the centre-line of the glacier and the adjoining summit plateau. These served a double purpose: to measure ablation rates over time, and, with careful differential GPS monitoring (±0.5 m accuracy), to assess flow patterns of the ice. Many of the stakes required re-drilling during the study due to rapid ablation rates resulting in their near-complete exhumation. During the field study it was shown that the summit plateau and the Whangaehu are in fact completely separate systems: in the modern setting the summit plateau is a down-wasting ablation zone flowing to the northwest, while Whangaehu ice velocities are perpendicular, in the range of 10-38 m/year to the southeast. While snow does accumulate temporarily at the summit, it is blown away by strong winds before the end of the balance year and acts as an important source for snow accumulating on the Whangaehu Glacier. 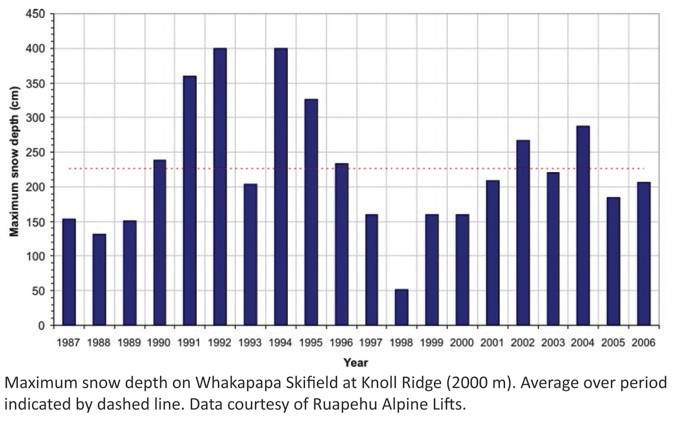 This means that the Whangaehu has an additional, ‘false’ ELA in its uppermost reaches, with its main accumulation zone being on the sheltered mid-slopes (as shown by data from the 2006 balance year at least). The stake and snow pit data from a single year are combined to calculate the net mass balance of the glacier. Results show that the slightly negative 2006 balance year was followed by positive mass balance in 2007, in part related to a 48% increase in precipitation. 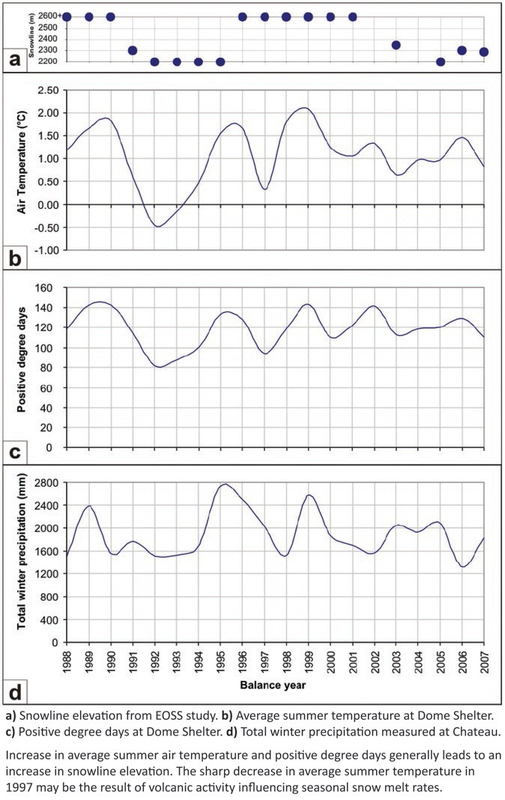 In the longer term however, mass balance is not strongly associated with winter precipitation and is instead dictated mainly by summer temperatures and the length of the ablation season as measured in positive degree days. 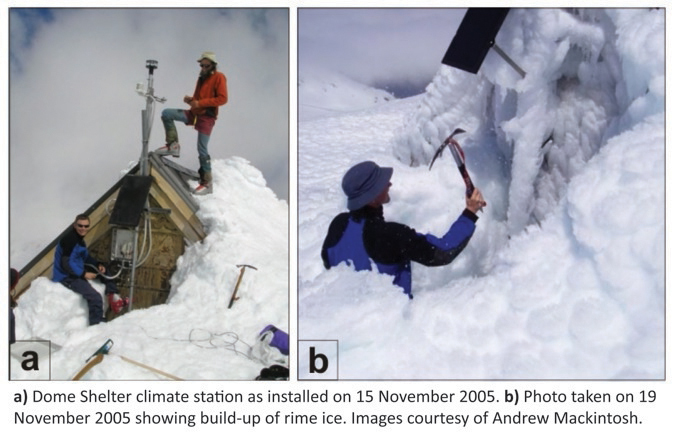 Relating the observed changes in mass balance to local climate required the installation of New Zealand’s highest automatic climate station at Dome shelter. This climate station measures high-resolution records of air temperature, humidity, incoming solar radiation, and wind direction and speed. Meteorological data collection at such elevations is plagued with problems: the build up of thick rime ice deposits around equipment; wind speed gauges regularly ‘maxing out’; and atmospheric temperature inversions all pose significant challenges to attaining usable information. By comparing temperature data from the new station to the long-running weather station at Chateau Tongariro, a temperature lapse rate of 5.96°C/1000 m was calculated. This allowed the extrapolation of the Dome shelter record back over the ~20-year period of the EOSS study. Ruapehu’s glaciers have behaved similarly to those in the Southern Alps in recent decades, but with noticeable exceptions. The glaciers share the summit with the Crater Lake and other vents: centres of frequent geothermal activity. As such, on top of climate trends, Ruapehu’s glaciers are also heavily influenced by the mountain’s volcanism. For example, the phreatomagmatic and strombolian eruptions of 1995-1996 caused mass gain on the summit plateau ice field through insulation of underlying ice by thick tephra deposits. 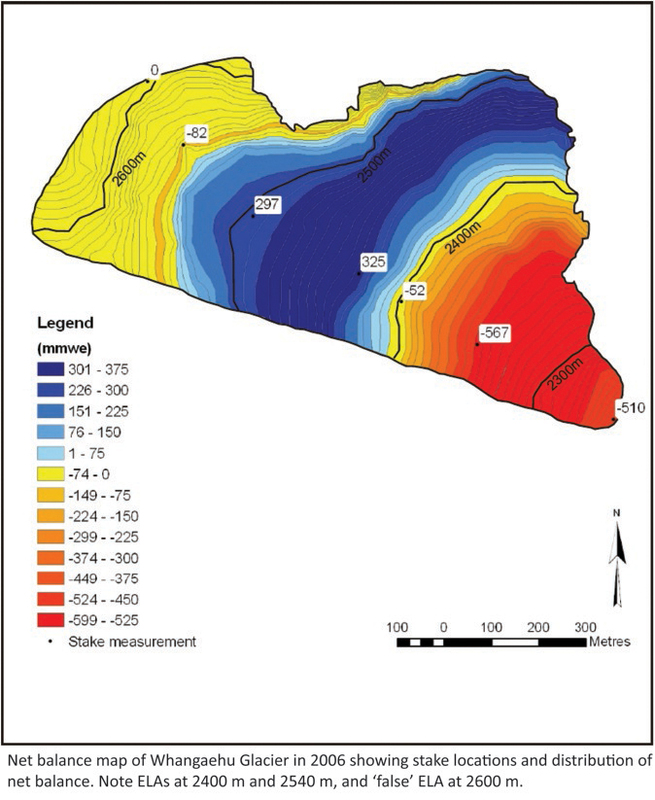 In other areas thin tephra mantles absorbed solar radiation and locally reduced the albedo, resulting in accelerated melt and compounding mass losses related to lahars. The Tuwharetoa Glacier, the only glacier to experience persistent positive mass balance on the mountain, actually owes its enigmatic growth to a lahar, and the consequent lowering of Crater Lake into which it formerly calved, which allowed the glacier to surge across the newly exposed lake bed. Lee-side accumulation of snow and solar shielding by surrounding peaks helps sustain this stoic exception to Ruapehu’s rule. Glacial responses to volcanic phenomena are generally short-lived however, and climate remains the most important control of Ruapehu’s permanent ice. The major drivers of New Zealand climate (temperature and precipitation) at a sub-decadal timescale are the regional- to hemispheric-scale atmospheric circulation regimes of the El NiÃ±o Southern Oscillation (ENSO) and the Southern Annular Mode (SAM). The SAM refers to the strength of the southern polar vortex: when atmospheric pressure is low over Antarctica the southern mid-latitude weather systems speed up. Positive mass balance of New Zealand’s glaciers appears to be correlated to El NiÃ±o conditions (the negative phase of the Southern Oscillation Index or SOI), when we experience increased southerly and westerly airflow, but its relationship to the SAM is not yet well established. While the 20-year record presented in this study suggests that the Whangaehu Glacier has been approximately in equilibrium during this time, the trend of increasing positive degree days is worrying. It may be that this hiatus in retreat will soon end and the mountain’s glaciers will resume their slow death as global temperatures rise: an unnaturally warming backdrop on which regional climate variability will continue to operate. It will be a great shame if, through the total loss of Ruapehu’s remaining glaciers to unchecked anthropogenic global warming, we — much like Harry in Hemingway’s poignant short story — are left only with the regret that we didn’t make the most of our experience and capabilities in the time that we had. This research project would not have been possible without the support of Dr. Andrew Mackintosh (ARC – field work and academic supervision), Dr. Brian Anderson (ARC – automatic weather station installation and monitoring) and Dr. Harry Keys (DOC – aerial photography for EOSS study). Thanks for that – very informative and sobering. It will be a great pity if it does finally disappear, the Whangaehu is a nice summer ski run for any ski tourers jonesing for some turns in December. Journeys to the Ice was the blog of Matthew Wood. We've archived his posts here for your reading pleasure.